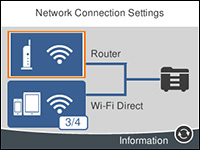 If you have a WPS-enabled wireless router or access point, you can use Wi-Fi Protected Setup (WPS) to connect your product to the network. Select Push Button Setup (WPS). Follow the instructions on the LCD screen to complete WPS setup. Note: If you don't see the icon, repeat these steps to try again.